Where location and luxury live in harmony. 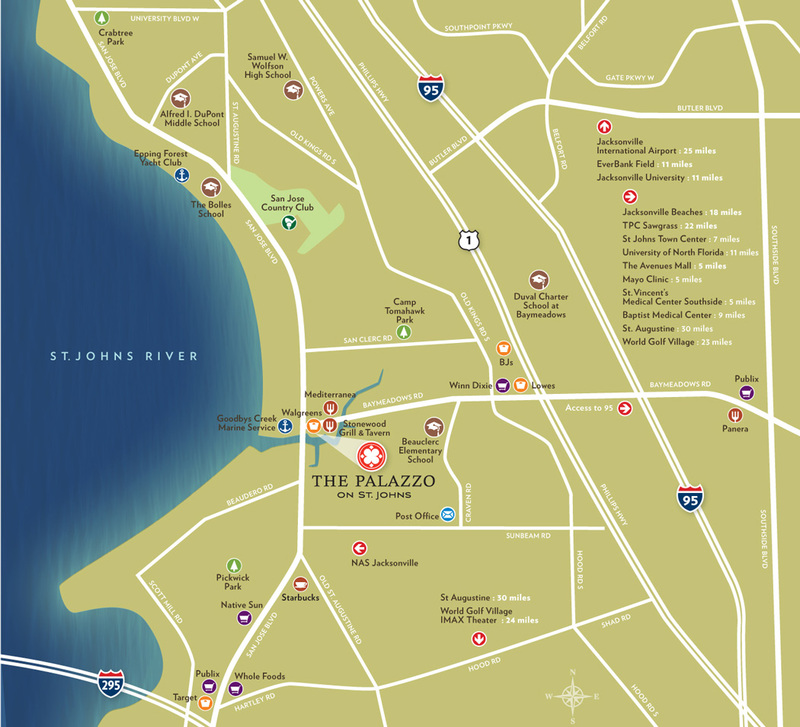 The Palazzo on St. Johns offers the unique combination of riverfront living and convenient access to the fantastic restaurants, shops and cultural attractions of Jacksonville. The St. Johns River flows through the city – and right past your home – when you live at the Palazzo. The river is a favorite spot for fishing, boating, water skiing or just people watching. For many, the beach is the main draw of Jacksonville – and our waterfront luxury condos put you just steps away from the shore. But the parks are something you have to experience as well. Jacksonville is home of the largest urban parks system in the entire country. Explore over 111,000 acres of preserved land and more than 300 designated park locations. If you like your greenery with a few “holes” in it, try one of the popular golf courses in the area. Nearby Ponte Vedra is a PGA Tour home base, and Jacksonville has several other fine courses to choose from. And who can forget that the Jacksonville Jaguars bring the NFL experience to your front door? Sink your toes into the sand, enjoy a round of golf or indulge in some retail therapy. With nature, sports, music, live entertainment and shopping within reach, you don’t have to rush to enjoy the good life. Enjoy life at a relaxing pace, with your Jacksonville condo as your home base. ORAL REPRESENTATIONS CANNOT BE RELIED UPON AS CORRECTLY STATING REPRESENTATIONS OF THE DEVELOPER. FOR CORRECT REPRESENTATIONS, MAKE REFERENCE TO THIS BROCHURE AND TO THE DOCUMENTS REQUIRED BY SECTION 718.503, FLORIDA STATUTES, TO BE FURNISHED BY A DEVELOPER TO A PURCHASER OR LESSEE.